Since Xu and Zhang have never been to Fiji, they spent 70 to 80 percent of the time on researching, during which they found the spirits of the two countries sharing many similarities. As the 2019 Chinese New Year approaches, a set of stamps to celebrate the Year of the Pig was jointly issued by the Chinese Cultural Center in Fiji and Post Fiji yesterday. Since 2016, the stamp project invites different top notch artists to bridge Chinese and Fijian cultures through Chinese Zodiacs. This year’s stamps are designed by Xu Lixian and Zhang Tao, a team of designers based in Shenzhen – a major city in Guangdong Province in south eastern China that links Hong Kong to China’s mainland. Being the youngest designers in the project, they vowed to express the understanding of traditional culture and the relationship between China and Fiji from the perspective of the younger generation. Mr Xu said their goal was to picture traditional culture in a modernistic way. “We extracted elements from both the tradition of China and Fiji, then delivered in a modern language that resonates with most people. The design will be meaningless to overseas audiences if we just copy and paste the traditional patterns,” Mr Xu said. Since Mr Xu and Mr Zhang have never been to Fiji, they spent 70 to 80 per cent of the time on researching, during which they found the spirits of the two countries sharing many similarities. “We were surprised that elements of both countries can be bound together naturally and we completed the project in only seven days,” Mr Zhang said. Mr Zhang took a totem in the first stamp as an example. “It combines a Hibiscus, the floral emblem of Fiji, and a torch drawn from the Fijian traditional ritual,” he said. Conversations between China and Fiji are expected to have more common topics in the future since the two countries have more exchanges and cooperation under the Belt and Road Initiative. 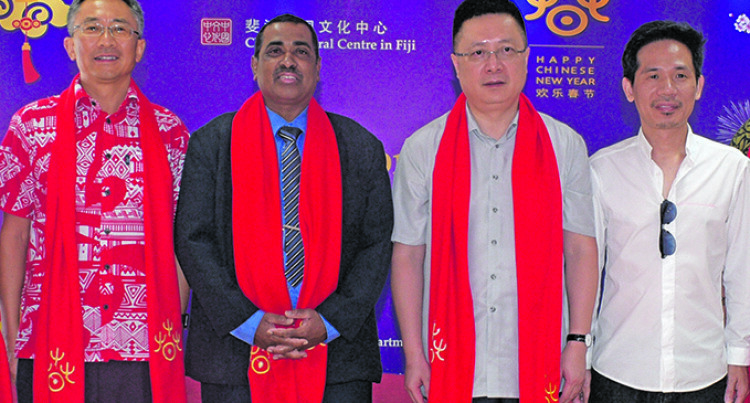 Guangdong, for instance, organised a series of roadshows to promote Fiji in recent years, and saw 21 projects worth RMB 331 million (FJ$104.39 million) signed between Guangdong and Fiji enterprises in 2018. Mr Xu and Mr Zhang believed that it’s a good timing for Chinese designers to go global. “We just set up a new branch in the US and we feel very confident,” Mr Zhang said. “Most of our clients teamed up with their overseas partners successfully in line with the Belt and Road.